Some of you may remember me.... wanted to thank everyone who helped in keeping this site alive. I am still here trying to get back the loving feeling of collecting again... I still adore my solids but haven't add news ones for several years now. Don't open the door slowly, slam it back and let us all know what you have been doing all this time. In this day and age it's not so much the collecting that keeps the site going but all the friendships that have been made. They are just so "cute"...what breed are they and what are their names. Me too...glad to see your post Lisa as well. And totally agree with what Margaret, Jacky and Katita have said. It really has been the good people here on this site and this has been proven especially these last few months. Your dogs are special Lisa. Great pics of them. You can tell them we say "hello". 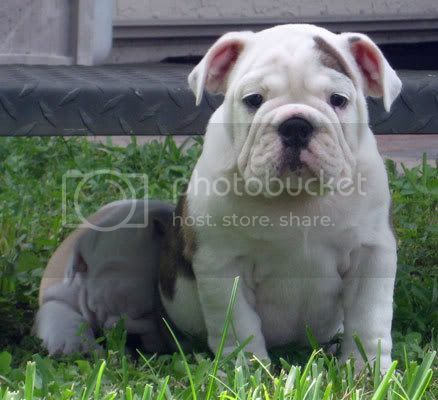 Are they English Bulldog puppies? They are adorable! How old are they and what are their names? My female (brindle) name is Kara. They are the sweetest most loving dogs.... both our Dobermans past away last summer at 13... they died within three months of each other... it was so hard to get over and go through... we are so happy now! Have been speculating what has happened to you and so very glad you came to have a look at the site and see all the friendships you created with this site. I love them all ! Have been thinking of you and well, here you are ! Makes me smile big ! What's news over here . . . ? We've just come back from taking our little Aussie Silky Terrier for a little Farm stay in a little village time place called Kangaroo Valley - it was just brilliant spending some time with him as all we seem to do is work, work, work! Last year I had a surprise major heart surgery - nothing in particular 'wrong' with me, but apparently a necessary 'thing' to have fixed since I had a hole in my heart since birth that I didn't know about . . . it just got bigger and bigger as I grew up. No real symptoms, just accidentally went to the docs for a check up for no real particular reason . . . like going to the dentist, but I do that annually and hadn't been to the doctors for 16 years . . . This year spent most of it renovating our kitchen. It's magical now, but at a cost of 3 times the budget originally planned, so it would want to be ! We're experiencing similar patterns to the rest of the world in terms of financial difficulties (though maybe not so extreme) and strange weather patterns . . . we've had our share of disasters here too (with extreme fires - many lives and homes lost), but otherwise everyone is happy with what they have. In terms of solid perfume collections, well I'm tentatively buying again, and very happy learning more about the new ones coming out and even writing about them in the story. I love your 'new' doggies and was sad to hear about your other ones passing away. I know they would have had a great life with you guys though. You take care and make sure you come back here more often ! We have all missed you probably more than you know. Sandra... yes I hear ya on the depression.... it's bitten me too! Let's together check in more and try to get the collecting spark back!! Sandra... oh dear... what an ordeal you have been through.... so sorry to hear about needing major surgery but glad to hear you caught something potentially harmful in the long run. I would love to see your renovation... sounds great. Anyone Facebook.... I just made a Solid Perfume page... not done yet but thought I would be fun to reconnect. If anyone wants to join my personal page... let me know. More... more checking in please.. I would love to hear from everyone and get into the swing of things again. Before you press the Panic Button and run back into the closet, please know that I'm in Therapy and heavily medicated. All is well! Just glad to see you back...even little snippets are a good way to start. After all, this WAS your idea...it IS your site...and it's still the Best. Hey Lisa! It's great to hear from you. I still collect but not as much. I even passed on the Harrods because of the exchange rate. Instead I'm renovating my house in Tampa - painting, new furniture, new granite countertops, and new floors soon. Since I can't sell, I have to make the house more comfortable. I'm sorry to hear about your greyhounds but happy that you have new ones to dote on. I expanded my family to 3 cats. I took in a feral kitty last year. Her name is Cupcake. She wouldn't come out of the closet for 2 months. Now she sleeps on my lap and follows me everywhere. I just took my first vacation in over a year. I went with a friend to photograph hummingbirds in the mountains of Ecuador. It was great! I enjoy this Board tremendously. Much thanks to you and Jack for making it work. Edited by Ar, 19 November 2009 - 09:47 PM.